The last place Jessica expected to end up on moving day was her vet! But, when her beloved kitty “Kitten” ran under a bed to escape all the activity and banged her head on the frame, that’s exactly where they both ended up. Unable to walk and with her eyes rolling and feet falling from under her, Kit ten was rushed to Sheridan Animal Hospital where Dr. Schepis and staff swung into action. We’ll never know the full story of what happened. What we can tell you is that Casey, a 3-year-old pooch with a delightful mixed ancestry, ran away for the day and returned to her owners limping and with lacerations all over her body. She was rushed to her regular vet where she was immediately given pain medications and placed on I.V. fluids. X-Rays revealed her hips were dislocated. Casey underwent anesthesia to have her hip and lacerations repaired. Her parents never saw this emergency coming and without the aid of the Pet Emergency Fund would not have been able to afford the full treatment she needed. Now Casey is fully recovered and has another chance thanks to all those who donate. A corn cob almost killed Rupert, a curious four-year-old Rottweiler mix, when he innocently got into a garbage pail that smelled too good to resist. Almost immediately his family noticed he was very sick. 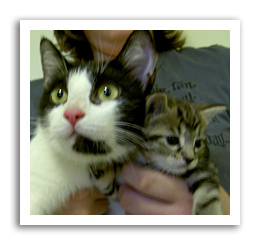 Rupert was rushed to his regular vet where he was placed on I.V. fluids. X-Rays revealed the corn cob stuck in his intestines. 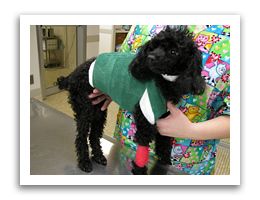 Rupert had major abdominal surgery to remove the cob and dead intestines. After five days in intensive care, multiple plasma transfusions and a lot of tender loving care, Rupert made a complete recovery and is enjoying his new lease on life, sans corn cobs! His parents will be forever thankful to the PEF donors who made his second chance possible. Vomiting that would not stop prompted Lola’s family to rush the five- year-old female Boxer to their veterinarian. She was diagnosed with pancreatitis and was hospitalized and underwent intensive medical therapy. 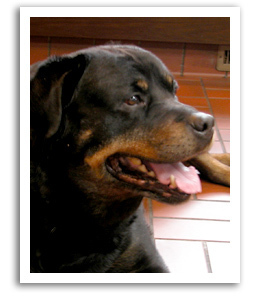 Because Lola’s owner was constrained by finances, assistance was offered by the Pet Emergency Fund. Due to the generosity of others, Lola recovered fully from her disease. Her owner cannot thank each individual donor enough who gave their own money to help others in a time of need.